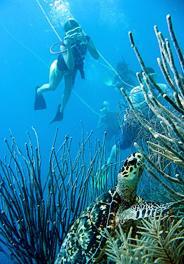 Belize Barrier Reef Reserve System lies about half a mile off the winward side of the island. It is the longest barrier reef in the Western Hemisphere and the second longest in the world. To the east of the Barrier Reef are three separate atoll reefs. There is also a fourth atoll reef, Banco Chinchorro, just to the north in Mexican waters, which will be of particular interest to wreck divers. The three Belize atoll reefs are formed on two tiers of submarine ridges: Turneffe and Glover's on one ridge and Lighthouse on a separate ridge farther to the east. This accounts for their similar outlines and NE-SW orientations. Deep marine trenches separate the two ridges. Flying south into Belize, you can see the reef as an unbroken chain of white surf running along the Caribbean coast of the Yucatan Peninsula and continuing south almost the whole length of the country to the Ranguana and Sapodilla Cayes. 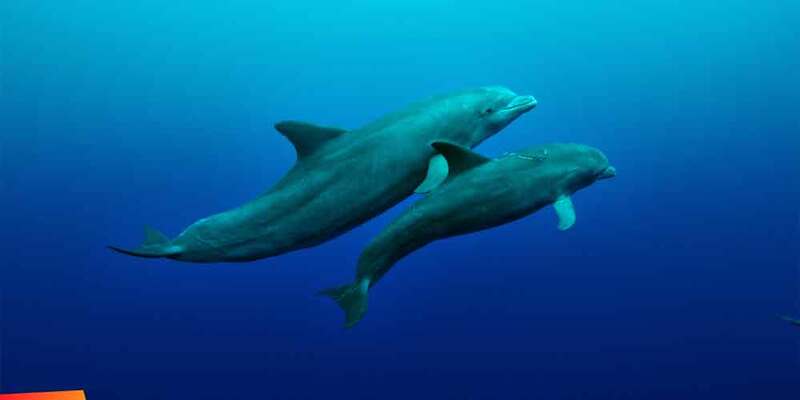 Marine Biodiversity: What is it…and why it is so important? Why Do We Need To Save The Reef? Barracuda-Fish with a "Bad Rep"
Marine Protected Areas - Who Benefits? Plantains or Plankton - Where's the Balance? Seahorse - Here to Stay? Coral Bleaching - What does it mean for the Reef? Sharks - Friend or Foe? 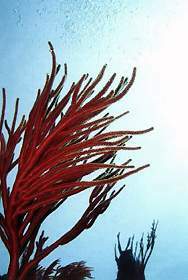 For extensive information on the plant and animal life in the reefs, CLICK HERE. For information on the Meso-American Barrier-Reef System (MBRS) Project, click here. Inside the reef the water is shallow, with a blue tinge; outside the reef the water is deep and from the air shows a dark royal blue. On very clear days the reef appears as a narrow yellow line dividing the two shades of blue. Only near Ambergris Caye does the reef run so close to a well-populated caye. Here it is an almost so!id wall of magnificent coral formation broken only by narrow channels called "quebradas". Here an observant diver can be kept entertained for hours on end by the unending variety, shapes and colours ofthe tropical coral. But the Belize Barrier Reef Reserve System is more than just a decorative sideshow. Without it the island would not exist for it serves as a natural break-water protecting the beach from erosion by the waves, and sheltering the caye and its inhabitants. The remarkably clear and shallow water inside the reef allows excellent viewing of the fabulous marine life of the area. Rainbow tinged tropical fish, delicate sea fans and majestic coral gardens abound. Outside the reef, the seabed drops sharply in a series of plateau to depths of thousands of feet. Out here in the blue are found the gamefish - mackerel, kingfish, wahoo, tuna, sailfish and marlin. Although it looks Iike dead stone, the reef is in fact a living wall formed by millions of coral organisms. These coral are carnivorous animals, known as polyps, which eat small sea creatures that float by, capturing them with stinging tentacles. They feed, however, only at night, pulling their tentacles back into the skeleton during the day. Within the reef skeleton live minute blue green algae. These give off oxygen which the coral polyps breathe; the algae, in turn absorb the carbon dioxide which the polyps give off, forming thus a genuine symbiotic relationship. Coral are multicoloured varying from gold to red, orange, green, brown and yellow The soft, living tube shaped coral polyp protects itself by forming a hard layer of calcium carbonate called the corallite. Colonies ofthese polyps form the structure of the coral reef growing in strange and exotic shapes that give the different varieties their popular names, such as brain coral, staghorn coral and elkhorn coral. The reef needs two factors to survive - solar energy and chemical nutrients. The nutrients flow into the sea as plant and animal organic material from rivers and creeks on the mainland and on the caye itself The organic material is broken down into its chemical derivates by bacteria and other microorganisms, thus providing the nutrients necessary for reef growth. The warm clear water off the coast of Belize, fed as it is by various mainland rivers and streams, form an excellent environment for the reef. 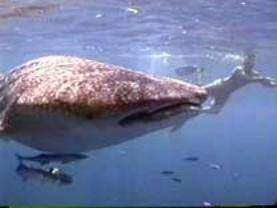 The entire island of Ambergris in fact probably resulted from the accumulation of coral fragments along with silt from the Rio Hondo. The report of the British Honduras Land Use Survey Team of l959 notes: "The connected chains of coral islands known as Ambergris Caye was formed from the accumulation of coral fragments...first as a shoal patch. These shoals tend to build up in long lines parallel to the coast of the mainland. It is thought that their orientation may be connected with submarine geological strata rather than being entirely the work of sea currents." The preceeding article was excerpted from the book Ambergris Caye, Paradise With A Past, published by Cubola Productions of Benque Viejo del Carmen and written by the Honourable Glenn D. Godfrey, Area Representative from Belize Rural South. It is available in local bookstores. 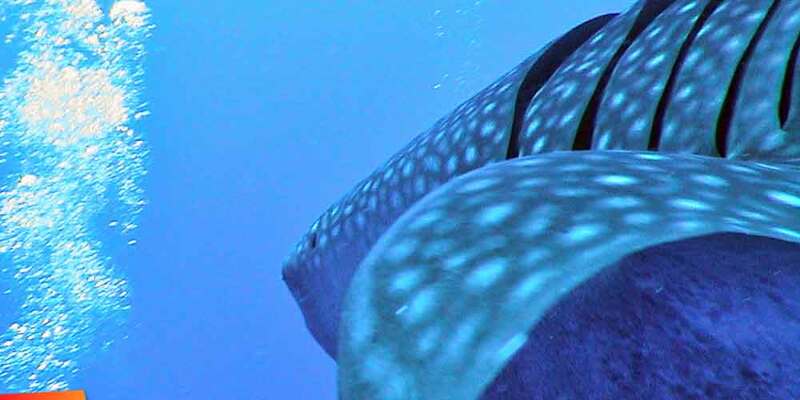 The Belize Barrier Reef Reserve System is located about half a mile from the windward side of the island, where you can find several Belize Barrier Reef resorts. It is the longest barrier reef in the Western Hemisphere and the second longest in the world. 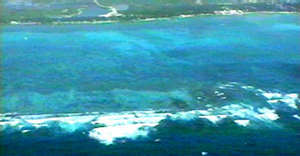 East of the Barrier Reef are three separate atoll reefs. A fourth atoll reef called Banco Chinchorro is located north in Mexican waters, and is a favorite among wreck divers. 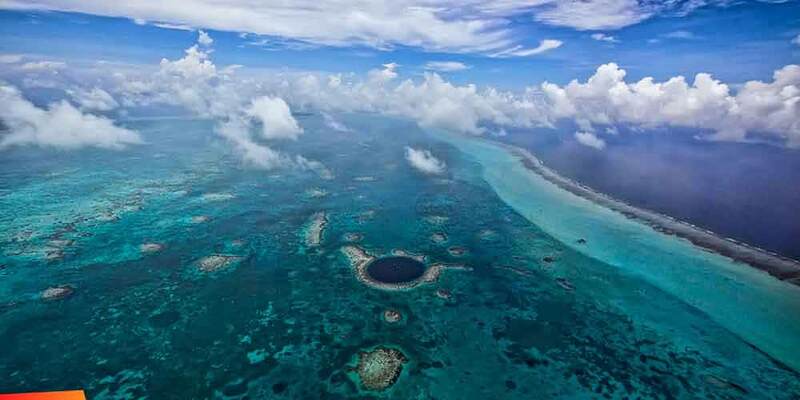 The three atoll reefs in Belize are formed on two tiers of submarine ridges. There is Glover’s and Turneffe on one ridge and Lighthouse on another ridge farther to the east, this they have the same outlines and NE-SW orientations. Separating the two ridges are deep marine trenches. When you fly south into the country, you will see the reef as a continuous chain of white surf running along the Caribbean coast of the Yucatan Peninsula. It continues south almost the whole length of the country to the Sapodilla and Ranguana Cayes. Inside the reef, the water is shallow with the blue tinge. From the outside, it is deep, while it is a dark royal blue from the air. During very clear days, the reef looks like a shallow line that divides the two shades of two. It is only near Ambergris Caye that the reef runs very close to a well-populated caye. Here, you will see an almost solid wall of stunning coral formation that is only broken by narrow channels called quebradas. Observant divers can be entertained for hours by the wide variety, colors and shapes of the tropical coral. However, the Belize Barrier Reef Reserve System is more than just a decorative slideshow. It serves as a natural break-water that protects the beach from erosion by the waves, sheltering the caye and its inhabitants. The shallow and clear water inside the reef allows for excellent viewing of the stunning marine life. Delicate sea fans, majestic coral gardens and rainbow-tinged tropical fish are abound. Outside the reef, the seabed sharply drops in a series of plateaus of varying depths. Here, game fishes are found, like marlin, sailfish, wahoo, tina, mackerel and king fish. Even though it looks like dead stone, the reef is actually a living wall formed by millions of coral organisms. These corals are carnivorous, called polyps, and eat small creatures that float by, capturing them using their stinging tentacles. 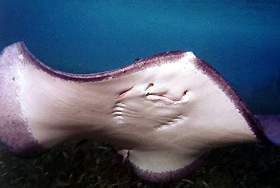 However, they only feed at night and they pull their tentacles back into their skeleton during the day. 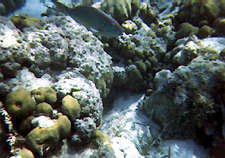 Living in the reef skeleton are minute blue green algae that give off oxygen which the coral polyps breathe. In turn, the algae absorbs the carbon dioxide that the polyps give off, forming a symbiotic relationship. Corals come in various colors, everything from orange to red to brown to yellow to green, which you can see in Belize Barrier Reef snorkeling excursions. The soft, living, tube-shaped coral polyp protects itself by forming a hard layer of calcium carbonate around itself, which is called the corallite. Colonies of these polyps create the structure of the coral reef that is growing in exotic and strange shapes that give the different kinds their popular names, like elkhorn coral, staghorn coral and brain coral, among many others. 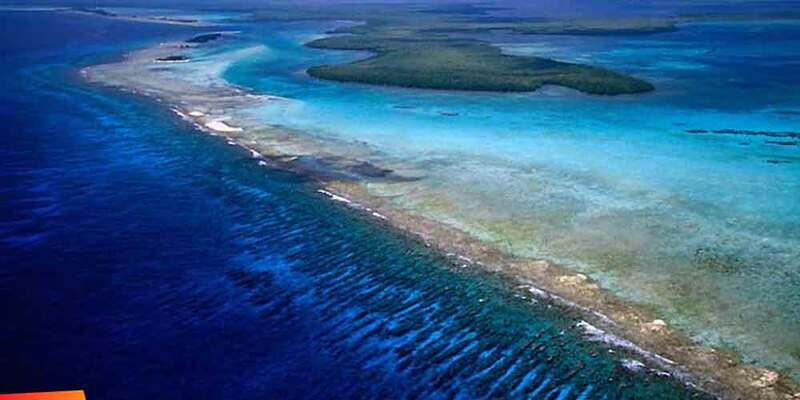 Here is one Belize Barrier Reef fact: the reef needs two things to survive, chemical nutrients and solar energy. These nutrients flow into the sea and animal and plant organic material from creeks and rivers on the caye and mainland. The organic material is broken down into its chemical derivatives by bacteria and other microorganisms, giving the nutrients needed for reef growth. The warm clear water off the coast of Belize create an excellent environment for the reef, fed by different mainland streams and rivers. The whole Ambergris island probably resulted from the accumulation of coral fragments along with silt from the Rio Hondo. According to the report of the British Honduras Land Use Survey Team of 1959, ‘the connected chains of coral islands known as Ambergris Caye was formed from the accumulation of coral fragments…first as a shoal patch. These shoals tend to build up in long lines parallel to the coast of the mainland. It is though that their orientation may be connected with marine geological strata rather than being entirely the work of sea currents. The amazing photograph of the dolphins in the slideshow at the top of the page is by Martin Spragg. It was taken at Gladden Spit. Click here for Reef Check Info on the condition of reefs worldwide.